Zucchini Frittata - best and easiest frittata with zucchini and corn. 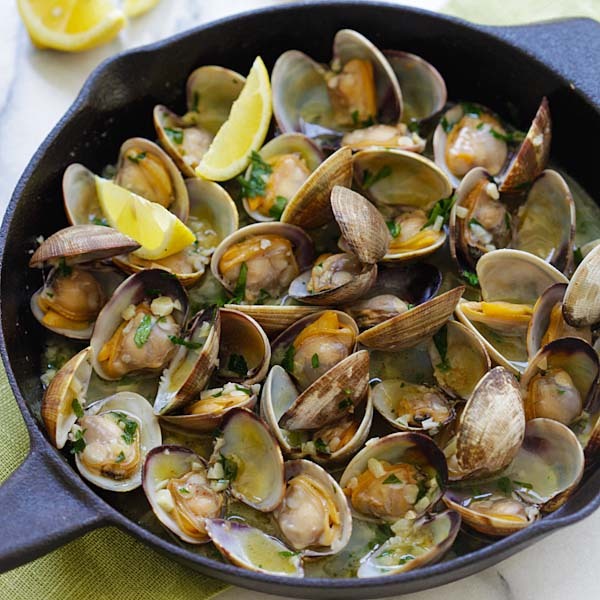 Takes 15 mins to make with only 3 key ingredients, so good! It’s zucchini season this time of year and I have just the perfect recipe for you this summer. This zucchini frittata is so easy to make but absolutely delicious. 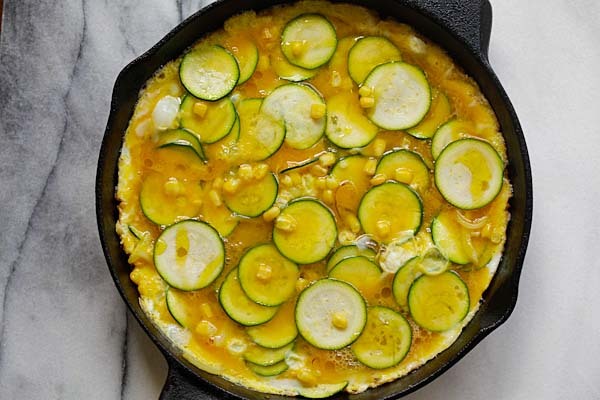 Imagine thick and fluffy frittata loaded with thin slices of zucchini and adorned with sweet corn kernels. My mouth is watering thinking of it. 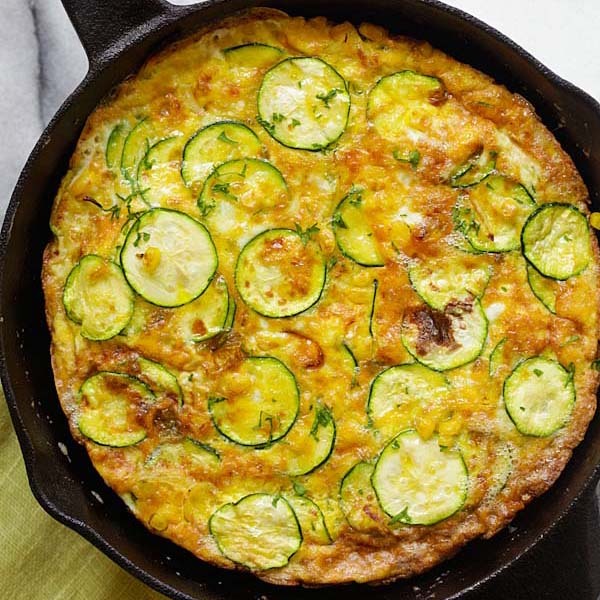 I love it that I can serve this zucchini frittata as a healthy breakfast, as a quick lunch or dinner for the entire family. It’s so easy to make and takes practically 15 minutes. There is no dishes to wash as you serve it as is, on the skillet. This zucchini frittata recipe is adapted from Martha Stewart. Get some zucchini from the market and make this today. Your family will be thankful if you do. Enjoy! Zucchini Frittata – best and easiest frittata with zucchini and corn. 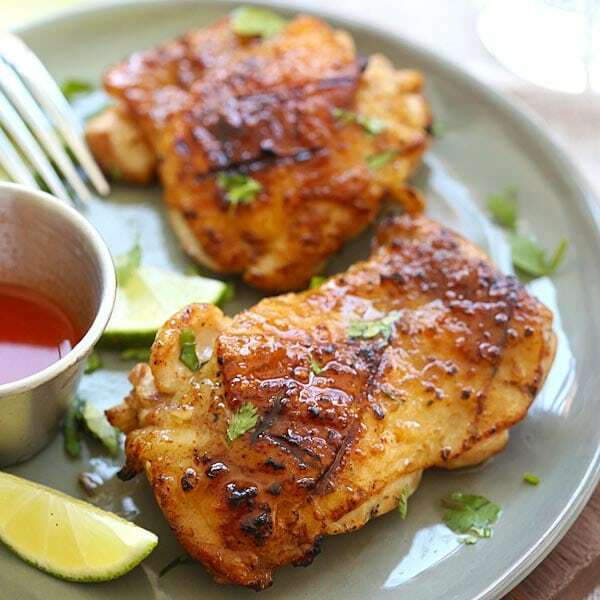 Takes 15 mins to make with only 3 key ingredients, so good! Crack the eggs into a big bowl and add the salt and lightly beaten the eggs. Heat up a cast-iron skillet (preferred) on medium heat and add the oil. 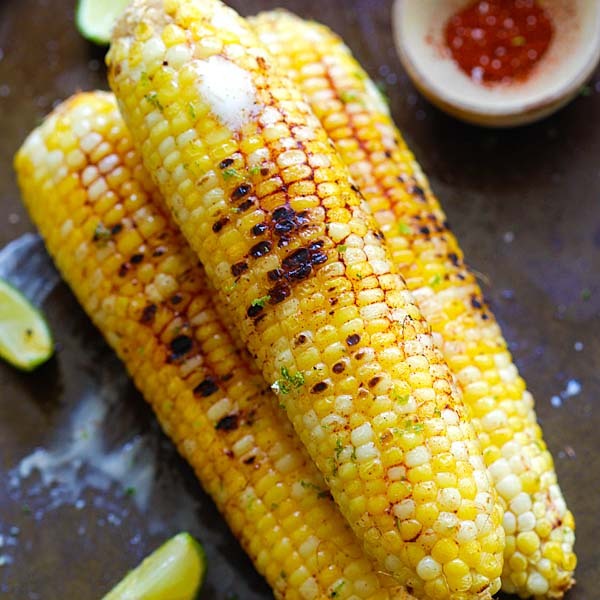 Saute the onion until slightly caramelized before adding the zucchini and sweet corn. Cook for 30 seconds before adding the eggs into the the skillet. Cook for 1-2 minutes or until the edges of the eggs start to turn light brown. Transfer the skillet into the oven and bake for 10 minutes. Broil for 1 minute or until surface is nicely browned. Remove from the oven, and sliced into wedges. Serve warm. All photos and recipes on Rasa Malaysia are copyright protected. Please do not use the photos and recipes without prior written permission. If you wish to republish this recipe, please rewrite the recipe in your own words instead of copy and paste and link back to //rasamalaysia.com/zucchini-frittata/. Thank you very much! I added some diced red bell papper (for colour) and a light sprinkling of pepper jack cheese. Turned out great. Thanks for the recipe. Your zucchini frittata sounds so yummy!